The field specifications provided below are general guidelines pulled from the governing rules for our Softball and Baseball programs and may be modified by our local league rules. Furthermore, the fields available to the league (both home and away) may vary in dimension. The fields used by our league may be located on school district property or on parks owned by league towns. While the league makes efforts to maintain the fields to rule specification, ultimately it is the school district or town that has set the dimensions of their fields. In general it is the home team coaches responsibility to rake the infield, set the bases, and chalk the fields. We encourage coaches to enlist the help of parents to aid in this task prior to the start of the game. Tools and lime are stored at each field in either a storage shed or box and may be secured with a key or combination lock. Combinations or keys may be acquired by contacting the facilities manager for the league or a board member. Below coaches may find guidance on field dimensions and the chalking requirements for our programs. Note: Dimensions provided conform to the current ASA and Essex County Women's Softball League rules where appropriate. 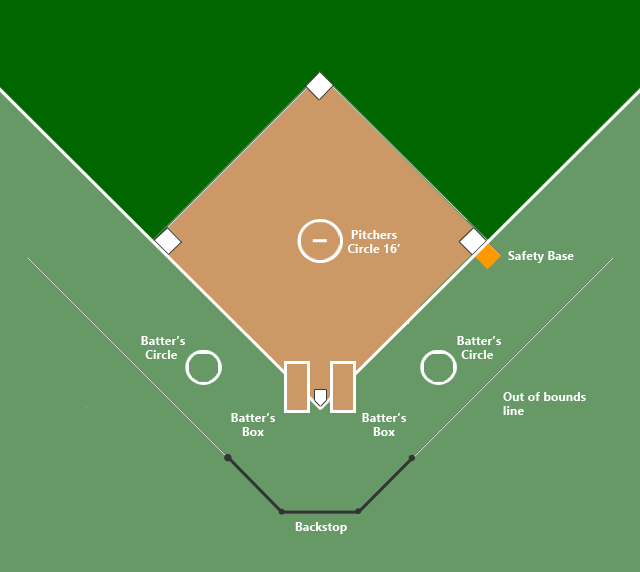 A safety base is to be used at first base in all division. Chalk for the foul lines are extensions of the angled sides of the home base apex and which are at a 90 degree angle of the of home base tip. The lines should run well into the outfield or to the outfield fence if one is present. 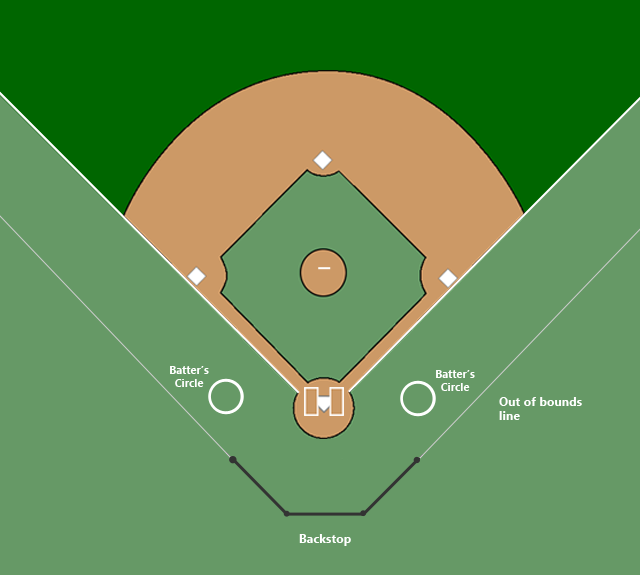 The lines should not cross through either of the batter's boxes. Batter's box should be chalked using the available chalking template at each field and will be stored in the field's equipment shed. If no template is available for the field, then the box should be measured 4' x 6' and centered 6" off of home plate. Coaches Box: 4' x 8' located 3' to 5' from the foul line. Note: Dimensions provided conform to the current Little League field dimensions for Majors division and younger, but not including Tee Ball. Pitching distance may be shortened at the league's discretion for our AA program and shortened at the intertown league's discretion for AAA players. For our Tee Ball program we use throw down bases in an open field rather than using any formal diamond size as may be defined by Little League or PONY ball. Base to base distance is up to the coach's discretion, but is generally 20' to 35'. This will depend on the ages of the players, player ability, and field space available.